Every year for our family Halloween party, Thing 2 gets really excited when I tell her that I’m going to make what she calls “Graveyard Dip”. It’s really just a basic five-layer dip that I learned how to make from my cousin, decorated a bit to fit the Halloween theme. 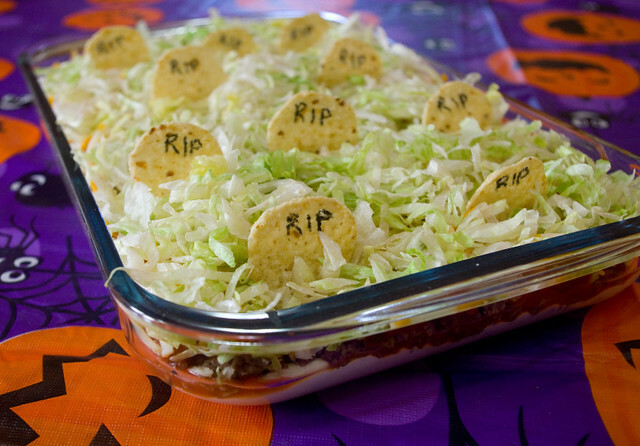 My cousin calls it “Wacko Taco Dip”, which is what we call it the rest of the year when I bring it to parties without the “gravestones”. It’s really quick and simple to make, and can be made the night before (or even a few nights before) if you’re well-prepared, or immediately before an event if you’re not. It will taste just as good either way. The measurements of the recipe may seem kind of arbitrary at first glance, but they’re made to be the size of a single package of that ingredient. If you’re doling out the ingredients from larger containers, don’t be too worried that your measurements are totally precise, since this recipe is very forgiving. When I discovered that I was lactose intolerant, one of the reasons I was sad was that I couldn’t have this dip any more. However, I’ve discovered that it’s now possible to buy lactose-free cream cheese, lactose-free sour cream, and lactose-free cheddar cheese. I substitute them in equal quantities for their counterparts in the recipe and it doesn’t bother my tummy at all! Pour off fat. Line a plate with paper towels. Put ground beef on paper towels to soak up any residual fat. Spread mixture evenly on the bottom of a 9″ x 14″ pan. Glass is preferable for looks alone; plastic or metal work just as well. Sprinkle cooked ground beef evenly over the mixture as the second layer. If making Wacko Taco dip, the dish is complete! Serve alongside a bowl of your favourite tortilla chips. Push each of these chips into the dip halfway so that the “RIP” is visible on the top. Now you have your gravestones. Serve alongside a bowl of your favourite tortilla chips. As I’ve previously mentioned, I’m a big fan of thrillers and horror movies, and 1975’s Jaws was a pioneer of the genre. With its big-name director, iconic movie monster, and unforgettable score, this movie is definitely noteworthy in the history of film. However, what a lot of people forget is that it’s based on a 1974 novel by Peter Benchley, which was itself inspired by the 1916 New Jersey shark attacks. I knew that when I got an opportunity, I absolutely had to visit the location where it all started. Shark attacks have become somewhat expected in open ocean water, although in reality the likelihood of a shark attack is much lower than the hype would have us believe. However, in the summer of 1916 there was an intense heat wave and a polio epidemic in New Jersey and nearby New York City, which sent those who could manage it out to the seaside to swim and take in the ocean breezes. Perhaps the upsurge of people in the water attracted the sharks — or at the very least gave plenty of targets to the sharks that already lived in the area. Over twelve days in July, four people were killed and one seriously injured off the Jersey shore. Newspapers of the time, sensing a sensation, ran stories about fishermen catching all kinds of “man-eating” sharks, even though many of the photos had been taken long before the attacks. The panic level was high. The attack of Charles Vansant off of Beach Haven on July 1st and the attack of Charles Bruder off of Spring Lake on July 6th actually occurred in the while the men were swimming in the ocean, although they were very close to shore. 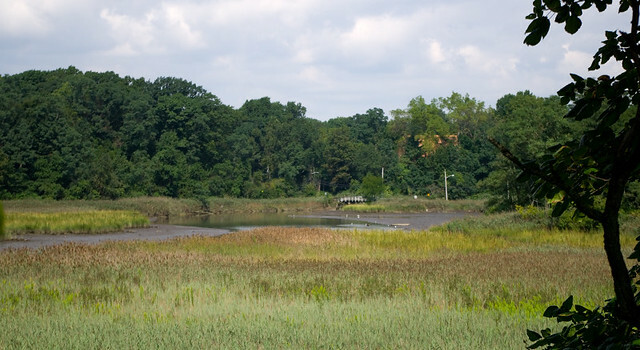 However, what stands out the most to me is that the July 12th attacks on Lester Stillwell and Stanley Fisher happened in Matawan Creek, which is brackish or even fresh water depending on how far upstream you go. Joseph Dunn, who was was the only person to survive the attacks, was also swimming somewhat up the creek when he was bitten by the shark half an hour after the two fatal attacks there. I can understand why the 1916 shark attacks gripped people of the time with such terror. After the first one, people were on guard; after the second proved that it wasn’t just a one-time event, most wise people along the ocean eschewed ocean swimming altogether. But no one could have predicted that there would be a shark in the fresh water of Matawan Creek. In the middle of a heat wave and long before the invention of air conditioning, all these poor people wanted to do was cool off. 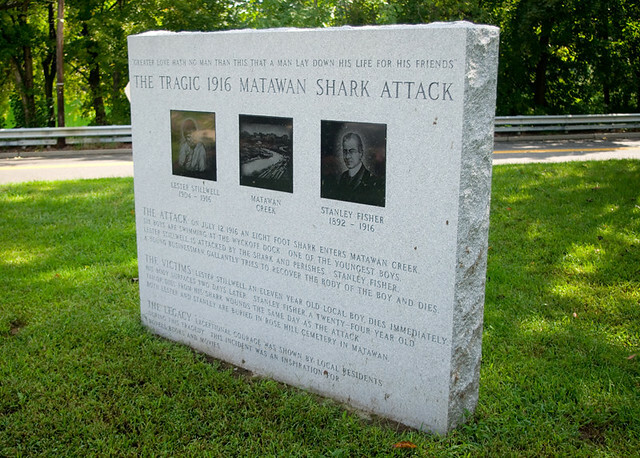 The Attack: On July 12, 1916 an eight foot shark enters Matawan Creek. Six boys are swimming at the Wyckoff dock. One of the youngest boys, Lester Stillwell, is attacked by the shark and perishes. Stanley Fisher, a young businessman, gallantly tries to recover the body of the boy and dies. The Victims: Lester Stillwell, and eleven year old local boy, dies immediately. His body surfaces two days later. Stanley Fisher, a twenty-four year old tailor, dies from his shark wounds the same day as the attack. 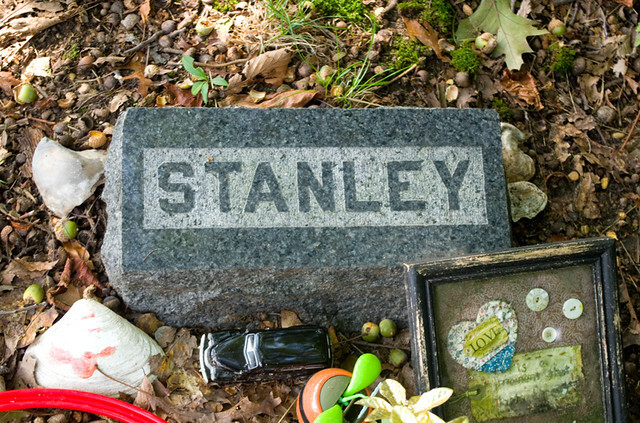 Both Lester and Stanley are buried in Rose Hill Cemetery in Matawan. The Legacy: Exceptional courage was shown by local residents during this tragedy. This incident was an inspiration for novels, books and movies. On July 14th, a 300lb bull shark (which can survive in both fresh water and saltwater) was caught, and when it was dissected 15lbs of human remains were found in its stomach. While that might not have been the only shark to attack a human over this period, there were no further attacks after it was caught. This is what Matawan Creek looks like today; in all honesty, it’s unremarkable in almost every way, except for its history. This is the section of the creek that is visible from the Main Street bridge over Gravelly Brook; the bridge in the background is Aberdeen Road. The attacks actually happened a bit further east from what you can see from the memorial site, just west of where the Garden State Parkway goes over the water. Visually, the only thing that stands out about this area is Lake Matawan, which is the body of water you can see behind the trees in the photo of the memorial. It looks like a bright green lawn that’s visible between the branches, but no, that is actually water. It is a brilliant shade of opaque emerald that I have never seen anywhere else. 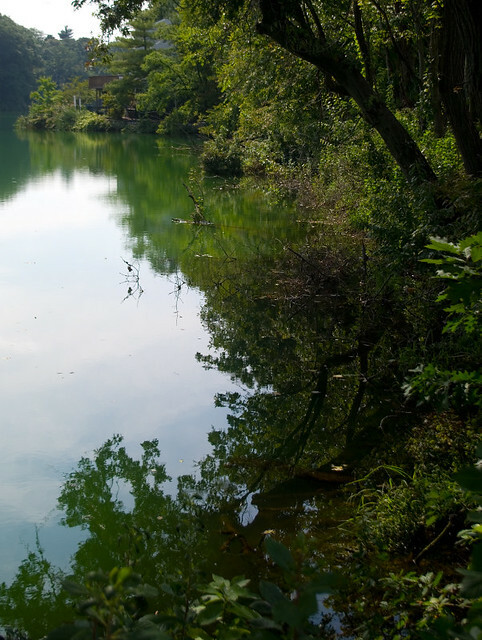 A bit of research leads me to understand that the lake is quite polluted and has a high copper content, and it is also actually highly acidic, meaning that very little aquatic life survives there except for one particularly brilliantly green variety of filamentous algae. The water here really looks like it should be in a canister labelled “TGRI”. 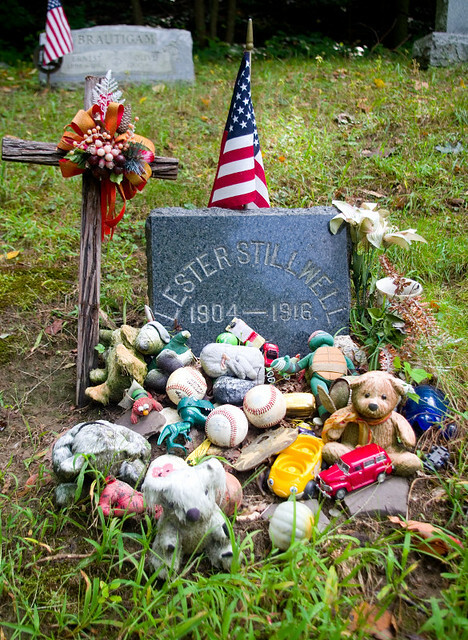 Popular interest in the shark attacks is evident by the mementos left at Lester Stillwell’s grave. Since the poor child died over a hundred years ago, it’s highly doubtful that family or friends who knew him are still visiting his gravestone. While I was the only person in the graveyard other than the gravediggers (do they still call them that? ), there had obviously been many visitors recently, probably over the summer, since the items weren’t too faded. Stanley Fisher was buried in a family plot just up the hill from Stillwell, so the family stone is the most prominent one. 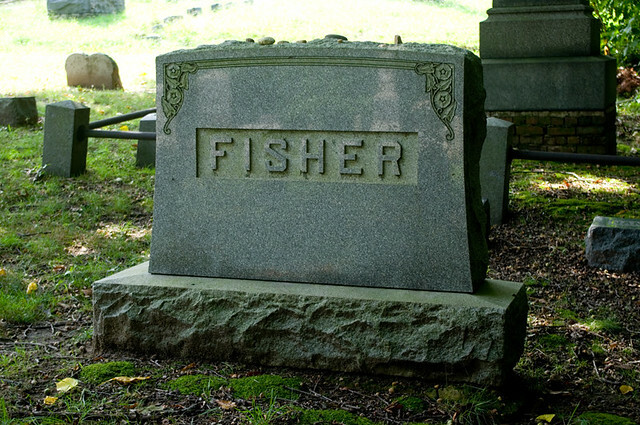 Fisher’s personal marker is a bit behind the stone bearing the family name, and it too shows evidence of recent visits, although not as much so as Stillwell’s. There were also a number of pebbles placed atop the family stone, much like at the Evans/Ellis cemetery. Now, as for rumours that this is “one of the most haunted cemeteries in the United States”? Don’t believe the hype. Even if I put stock in such things (which I don’t), this is a well-maintained, peaceful, not-at-all-scary cemetery. Tragic stories abound in this old graveyard, true; they don’t start and end with shark attack victims. Some of the graves date back to the 1700’s, and with a long enough history there are inevitably tales to be told. At the very least there are soldiers from the Revolutionary and Civil War buried there. But the reality is that all graveyards contain stories, because stories are how we remember the people who have passed. And sometimes those stories just so happen to be so gripping that they transcend the circle of people that we knew in life and become the basis for a tale that enthralls and terrifies audiences worldwide. I think that’s as close to a haunting as one can reasonably expect. Today I’m continuing with the interesting places I visited on my recent trip to the States, because heaven knows I won’t be cooking right now with this nasty cold knocking me off my feet. 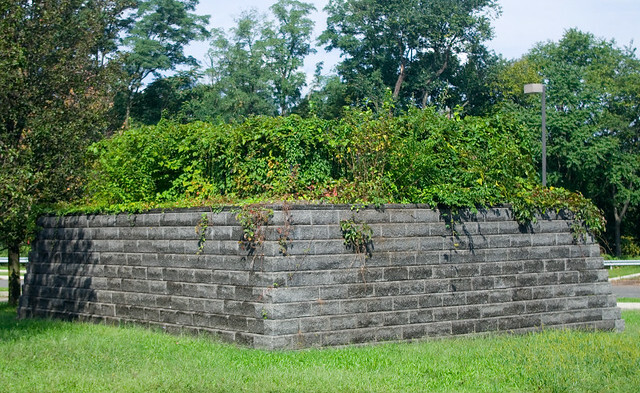 One of my favourite spots was the Evans/Ellis cemetery in New Brunswick, New Jersey. It’s a tiny little family cemetery, with only seven permanent residents and one gravestone (although there used to be two). 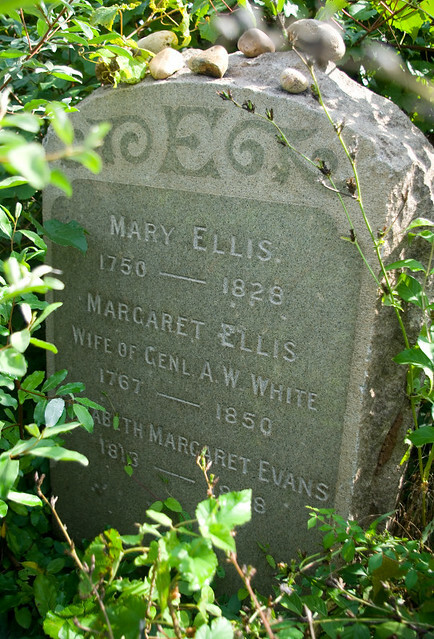 What makes the graveyard notable isn’t its occupants, although there were (untrue) rumours at one time that the story of Mary Ellis, whose name is first on the remaining headstone, was the inspiration for the 1972 pop song “Brandy (You’re a Fine Girl)”. No, what is most notable about this graveyard is its unusual location. This tiny little graveyard is right in the middle of the rear parking lot for an AMC movie theater! In the other direction, it overlooks a construction site. 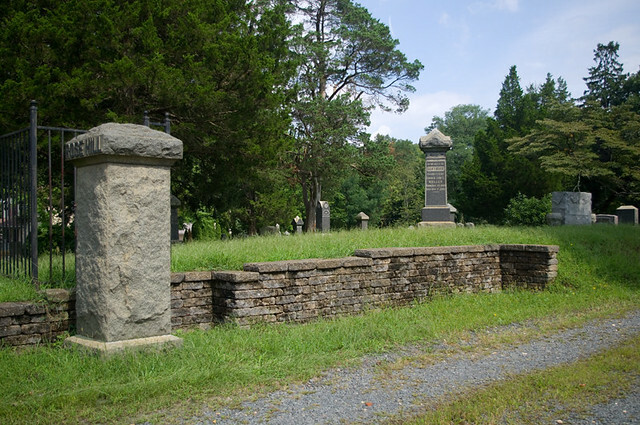 This little cemetery originally was on Mary Ellis’ private farmland, as so many old family plots used to be. 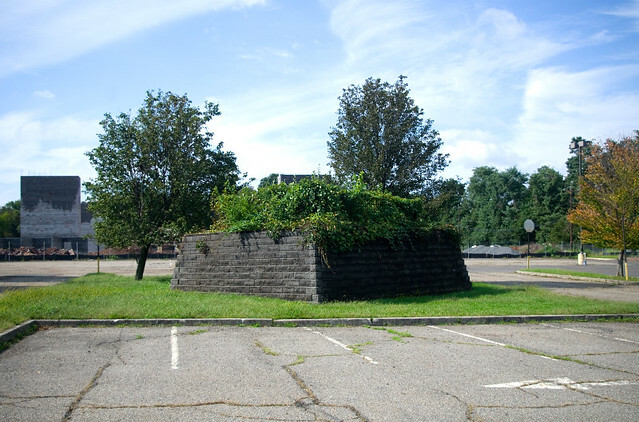 As you can see in the historical photographs from Weird N.J., it was originally on a small hill, surrounded by a wrought iron fence and had two headstones. However, the land was sold to developers in the 1960’s; since it is conveniently located next to US Highway 1, it is prime commercial real estate. 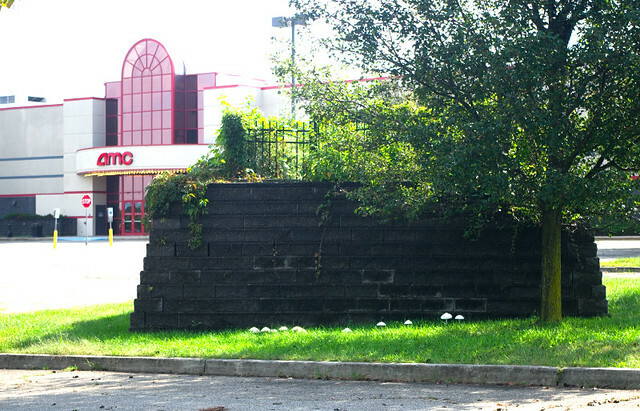 The ground around the plot was leveled to make for better parking for the Great Eastern Department Store, which eventually closed and became the Route 1 Flea Market. Then, once the land was sold again, the developers again declined to move the graves, instead choosing to bring the surrounding ground down even further. They built a rather attractive eight-foot retaining wall around the site, and now the graves overlook quite a stretch of pavement. 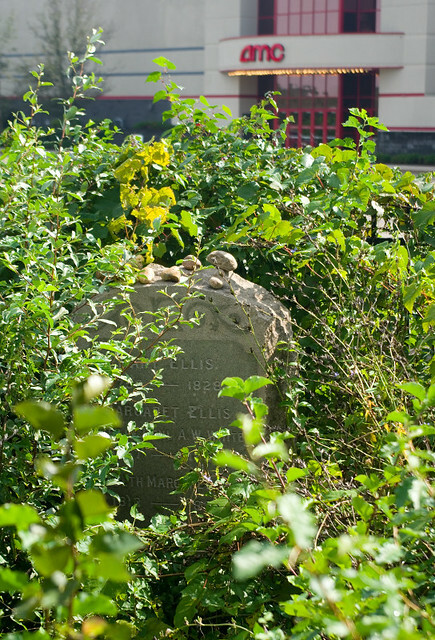 Unfortunately, despite the obvious evidence of visitors to the grave in the form of a rough path beaten down in the undergrowth and pebbles on top of the headstone, the Evans/Ellis cemetery is sadly neglected. If I’d had more time in the area, I might have headed out to the local hardware store to grab some gardening gloves and yard waste bags so as to rescue the plot from some very aggressive vines. If I’m ever back in town, I think I will do just that.